Ernie Banks - better known as Mr. Cub to the northside faithful - played his entire career at Wrigley Field for the Chicago Cubs, and was inducted into the National Baseball Hall of Fame. This amazing, full size bat is hand-painted and inscribed with images of Banks and his career statistics. Banks autograph appears on the bat. The fully-authenticated Adirondak personal model bat from McKay Sports will look amazing on any wall in your home or office. Get it before it is gone. Due to the very rare nature of this offer we must charge your credit card for the full price immediately upon taking your order. This policy ensures we reserve the bat for you. We will confirm your order by Email. This bat is not game used. Please allow 4 to 6 weeks for delivery. 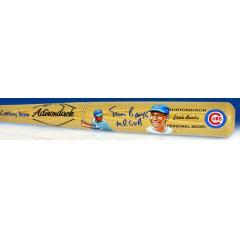 Ernie Banks Hall of Fame Career Hand Painted and Signed Bat $1,295.00 Sold Out!